Each region of Australia has vastly different climates, making it the perfect place for growing a variety of tropical and everyday fruits. These fruits are cultivated and harvested to maximise their taste and texture before being blended for delivery to your breakfast table. No preservatives. No added sugar. Keep refrigerated below 4°C. Shake well and drink within 5-7 days after opening. 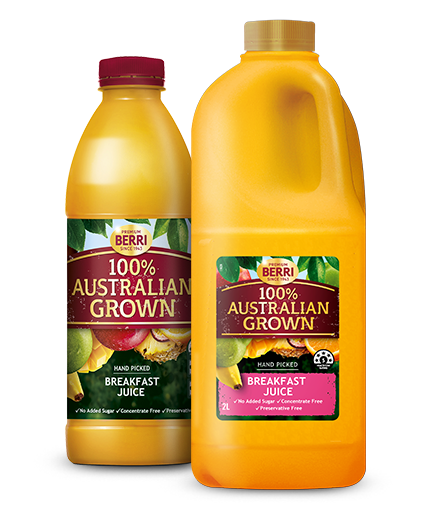 Fruit Juices [Orange (40%), Pear (40%), Apple (11.5%), Pineapple (3.1%) & Passionfruit (0.5%)], Fruit Purées [Banana (3.5%) & Mango (1.3%)], Vitamin C, Acidity Regulators (296, 330). Contains a blend of fresh juice, cold stored juice & cold stored fruit purées. * Percentage Daily Intake per serving. Percentage Daily Intakes are based on an average adult diet of 8700 kj. Your daily intakes may be higher or lower depending on your energy needs. # Recommended Dietary intake.